Whether you are traveling somewhere for an amazing spring break adventure, volunteering your time in town or away, or just staying home for some much needed and deserved downtime, spring break is an optimal time for relaxation. Hopefully, the extra time presents you with an opportunity to indulge in self-care and some quality time to do things you enjoy with people you care about. That said, it is equally important to take time to rest, relax and unplug from technology and your devices. While modern day technology, in the form of smartphones and tablets, is a great way to keep us all connected and more productive, it can also add unnecessary stress and take hours away from face-to-face interactions. 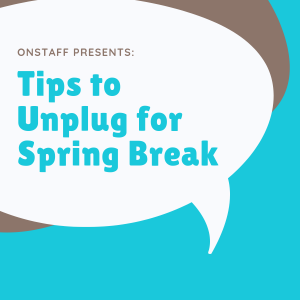 Therefore, since spring break already provides an opportunity to step away from the business of our day-to-day, try to unplug a little during this time. You don’t need to go completely dark, there is always a balance to strike – but these tips and tricks might help you find a little separation from the need to constantly reach for your device all day, every day. Set a goal. Whether it is to spend less time scrolling or responding to emails, identify an area you would like to improve on. Your phone may already have built-in screen time calculations, or you can download apps to help determine screen time. So, for example, if you spend approximately three hours a day on your phone normally, set a goal for the duration of your spring break to only spend two. Or, you can set a goal of only using phones/tablets between or during certain hours. Having a goal can make the process of cutting down screen time feel more like an accomplishment and less like a chore. Check emails once a day. If you are on spring break, there ideally shouldn’t be much need to be glued to your emails. You should consider setting a vacation or out of office auto-response for your incoming emails. This feature allows you to still check your emails, but it gives you the opportunity to notify your colleagues and customers that your response time may be delayed. You can still check once a day to make sure you don’t miss any emergencies or things you need/want to deal with immediately. But by limiting yourself to just once a day (whether that be morning or evening, it’s up to you), you’ll free up time to do other activities – or just do nothing if that’s what you want! Consider turning off your phone. Turning off your phone for a few hours can feel very freeing! It limits distractions from notifications and allows you to fully experience other activities. Sometimes this can be easier to practice on a specific activity, like if you are attending a movie or sporting event: instead of turning your phone to silent, turn it off for the duration! Or, you can turn your phone off for an hour or two every night either after or before dinner, so you can really take some time to yourself or spend it with your family without any potential distractions. This is probably good practice for everyday life, but spring break is a great time to start. Get a late start. If you’re like most people, then you probably reach for your smartphone before you’re even out of bed in the morning. However, this spring break, try not to reach for it until after breakfast. This can help you feel less dependent on the device and allow you to unplug from the chaos of technology. We so often get into the habit of scrolling through our social media apps, as well as the news and other messages, that we delay the process of productivity for ourselves in the morning. Because having an established routine is such an important part of mindfulness, try to work not having your phone readily available into your routine. Revel in the notion of spring break and even if you can’t necessarily sleep in, try to enjoy a few extra moments in the morning unplugged.